Martin & Sue Pearce live in Yorkshire. We have two grown up children - one is a teacher in an independent school, the other is a Chartered Civil Engineer. We have one grandson and one granddaughter. Sue is a retired physiotherapist and Martin is a retired Consultant Civil Engineer. The ability to relax and focus on the family in luxurious surroundings away from the world and yet easily join the hustle and bustle when you want to. This area of Crete, with its friendly and laid back people, has its own 'micro-climate' (SE Crete has more sunshine hours than any other part of Europe) and is famous for its jaw dropping scenery, stunning beaches, wonderful weather, olives and locally produced wine. It is less bustling and noisy than the north of the island yet still with plenty of things for an active family to do. toilet, shower, Large en-suite fully tiled bathroom. toilet, shower, Large fully tiled bathroom. Master en-suite with twin basins, WC & large shower. Second en-suite with basin, WC & large shower. House 'wet-room' with level access shower, WC & basin. Downstairs cloakroom - WC & basin. Note: there are no baths in this villa. Full air conditioning throughout - hot and cold to all rooms except the bathrooms. Via the air conditioning or open fireplace. All linen provided. Mid-stay change for stays of two weeks. Weekly change for stays of more than two weeks. Full size Bosch washing machine. Large fireplace with chimney and fireside tools. Note: Wood is not provided. Large parking area for up to six cars. All bath and hand towels provided as well as pool and beach towels. Mid-stay change for stays of two weeks. Weekly change for stays of more than two weeks. Living room with 3 x leather sofas,2 x occasional table, bean -bags, sideboard, TV, DVD player, I pod dock/HiFi,Wii console & games, work desk. Sofa bed (king size bed) area has two screens for privacy. Diswashers: 1 x Small Whirlpool and 1 x Large Miele. Four ring Whirlpool electric hob. Full size Whirlpool electric fan oven. Utility room which contains the washing machine, Miele dishwasher and further storage facilities. More than you can shake a stick at!! Outdoors there is a marble dining table plus chairs positioned under a pergola to provide shade for outdoor dining. Indoors there is a large oak dining table and seating available for ten people. Not satellite - but capable of streaming via a pc. Small library available. Guests are encouraged to borrow books and leave behind those they may have brought with them. Small amount of toys available - aimed at young children. There are around 100 DVD's of mixed interest and titles suitable for all ages. The villa is surrounded by its own productive olive grove and there are formal plantings to the villa and pool surrounds. All bedroom s have private balconies except for the twin/bunk rooms which share their own private balcony. A large veranda across the whole of the rear of the villa overlooking the pool area. Water sports can be found at Makrigialos adjacent to the Sun Wing hotel beach. Smoking only outside please. Ash trays are provided. Fully enclosed pool - very private. Notes on accommodation: The villa provides a very high standard of accommodation suitable for families or groups of friends. It has hot and cold air-conditioning throughout thus suitable for cooler times of year. Relaxation, either in doors or out is provided for by comfortable indoor and outdoor soft seating. Dining too can be either in an indoors or outdoors. 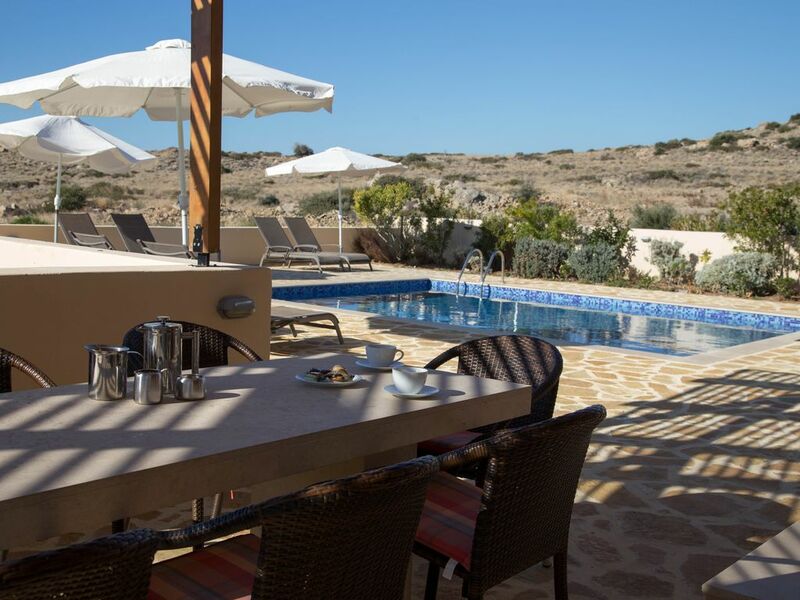 The very well equipped kitchen will enable the cooks to produce mouth watering feasts using local ingredients or the same local produce can be cooked outside on the large stone BBQ. The villa is not overlooked and has views to the sea and the mountains. The pool terrace provides opportunity to relax in the sun, whilst those who prefer shade can relax on the veranda. A large corner of the garden has outdoor sofa's and tables enjoying views of Lagada Ridge and the sea. Each bedroom has access to balconies (private to main bedrooms) with more seating and tables. Recommend no more than 8 adults. Outside: Pool is 7m x 5m x1.6m and is accessed by either steel ladder steps of two shallow steps in the shallow end. The pool is not heated but is warm in the summer months. It is cleaned and checked every two days by maintenance staff. The surrounding tiled area is all non-slip, with garden on the periphery. Eight sun loungers are provided along with cushioned seating for up to a dozen people. A number of large sun parasols are also provided for shade around the pool. There is also an ten seater marble table with a wooden pergola to provide shade for this dining area. The adjacent BBQ has its own work area i.e. lighting, sink and water supply. Utility Room: Storage cupboards, work surface, washing machine, clothes airer, clothes basket, ironing board & iron. Cleaning / Towels / Linen / Maid service: All linen and towels are provided and will be changed after seven days. Additionalyl pool towels are provided for use outside. A mid week clean & linen change is not included but can be arranged at extra cost - paid locally. Other: Dining area with oak dining table and eight matching chairs with leather upholstered seats. 'Family area' - with three sofas and a sofa bed, two occasional tables & bean bags. Two highs chairs and two cots with bedding are available. Tolles Haus, sehr gepflegt !!! Das Haus ist in einem wirklich sehr guten Zustand. Sauber!!!! Es bietet sehr viel Platz im und um das Haus. Auch die Poolanlage ist super. Die fest verankerten Sonnenschirme sind ideal, da es manchmal sehr windig ist. Wer seine Ruhe haben will, ist in diese Haus bestens bedient. Der Kontakt zum Vermieter und zum Verwalter ist sehr angenehm und funktioniert prima. Lediglich die Zufahrtsstraße (400-500 m) zu den 3-4 Häusern ist sehr gewöhnungsbedürftig (Schotterpiste bei der das Auto das eine oder andere mal aufsitzt) . Hier sollte dringend was gemacht werden!!! We are so pleased that you enjoyed your stay in our villa with all its fabulous facilities. Yes, we acknowledge that the road is not in the best of condition but it is not dissimilar to many other local roads in many parts of Crete. That said, we understand that the local council do intend to undertake repairs to the road over the winter period. Hopefully that intention will be carried out. We hope we may see you again sometime. The nearest beach is approximately ten minutes walk away, down hill. This beach has no facilities at present. A five minute drive into Makrigialos enables you to access the beautiful sheltered blue flag beach and bay of the town itself. Tavernas and bars are located adjacent to the beach and provide sunbeds and showers in addition to welcome refreshments. The nearest airport is Sitia which is being enlarged & developed. Currently it takes regular flights from Athens and as of April 2012 will be taking direct flights from Amsterdam. Most airlines use Heraklion Airport which is approximately 90 minutes drive away. The use of a car or motor bike is strongly recommended if staying at Villa Estia. Makrigialos is the nearest town and is approximately 3 Kms away. Ierpetra & Sitia are approximately 30 mins drive away - both towns offering a greater range of shops, bars and restaurants. This is a tourist spot that is hardly touched by the package holiday trade as the aim is to protect the local culture and prevent large scale development. It is unpretentious, charming and close to nature with a special 'feel'. There are only a couple of large hotels in Makrigialos. Some of the best weather in the whole of Europe is in this area due to its own micro-climate. Beaches are unspoiled. Take a drive round the nearby coast. There is a seemingly never ending succession of beautiful secluded bays and coves. Drive up into the mountains to see breath taking views of deserted sandy beaches with crystal clear water. Situated on the south east coast of Crete, Makrigialos is only 30 minutes from the local working towns of Ierapatra (south east coast) and Sitea (north west coast). Some of the best beaches in Crete all gently lapped by crystal clear waters of the Mediterranean sea. A mountain range runs West to East across the island which shelters the south coast and provides this fantastic climate - possibly the best in the Med. Makrigialos produces the best olive oil and has a very high specific gravity and is treasured by restaurants worldwide. The local produce is all of the highest quality and is available in all local restaurants, particularly lamb, fish, chicken, fruit, feta cheese, vegetables, wine and the world famous olive oil. Makrigialos is surrounded by thousands of acres of raw, majestic, Cretan countryside and mountains. Diaskari Beach - very quiet. Pervolakia Gorge - scenic walk with smells of the herbs. Dragons Cave - 2 km east along the coast road, looking back towards Makrigialos and the mountain backdrop. Diaskari Taverna - on the waters edge, shaded by trees with wonderful simple fresh food. Porphyra - Great Greek Meze and traditional Cretan food. Remains of a Roman villa and the Minoan Villa is within easy walking distance from the village. Booking Notes: Please note that the rental includes mid-stay cleaning only if two weeks or more are booked i.e. cleaning and linen/towel change after one week. If a mid-stay mid-week clean is required then this is to be arranged and paid for locally. No preferred change over day. Arrival is not before 15.00hrs and departure should be by 10.00hrs. This can be negotiated to suit flight times. Long stays e.g. 2,3 or 6 months are available. The price of which is negotiable.